It's a big claim to say that landing pages are the golden egg to digital marketing. However, we know this to be true through direct experience with our clients. 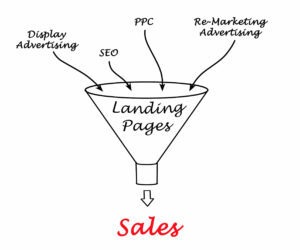 As shown in the illustration, landing pages act as a funnel for all your marketing efforts such as PPC, SEO, Display Ads & Re-Marketing and turn them into sales. But they do more than just boost your conversion rates. They allow you a better opportunity to tell your brand's story. Instead of users getting lost in a sea of pages on your home site, you're able to highlight the specific product/service you want them to see, and show them exactly why they need it. All on one page. You're able to deliver a stronger call to action and give them a more intimate experience they feel is directly catered to them and their needs. You're also saving them work - with fewer clicks to buy and less information to wade through, there is a higher chance of buying rather than "I'll come back to it later," or, "This isn't for me." Wait, so what is this "Landing Page" you speak of? It's a one-page extension of your brand. Through your marketing agency, you will work together to craft a single page that highlights a specific product/service you want to offer and will speak to your target audience. This audience will come to the landing page through SEO/PPC/Display Ads and will have the opportunity to read the story behind what your company is offering. And they will be encouraged to buy. We have found incredible success through our use of landing pages, and because of this, we have tailored our approach and learned the niche extremely well. Get it touch with us to hear more about what we can do for you!